Marbella (25 min), Malaga (35min) Picasso Museum: www.museopicassomalaga.org www.malagaturismo.com/home.jsp?id_idioma=2 , Ronda (1 h.) 'Bull Ring' an Historic Center: www.turismoderonda.es , Mijas, Costa del Sol, Granada (2 h.) ski for winter and La Alhambra: www.granadatur.com www.alhambra-tickets.es www.alhambradegranada.org (tickets), Seville (3 h.) www.turismo.sevilla.org Córdoba (2,5 h) www.turiscordoba.es , Gibraltar http://en.wikipedia.org/wiki/Gibraltar, and all little white villages of Guadalhorce Valley (Tolox, Monda, Alozaina, Guaro,Ardales, Casarabonela) and www.sierranieves.com/eng Sierra de Las Nieves (Natural Parq Biosphere Reserve for UNESCO). Also, in Villa Pereila 'Oranges free during the season to eat or to do natural orange juice'. The best qualities. Plot 4.000 m2 of gardens and orange trees. Private pool. Peace of mind to relax. Excellent location for visits in the area. You should read the opinions of other travelers. Cool and Warm. Living room. Powefull. Split type. Fans i the bedrooms. Lot of channels in several languages. Special holiday for a special birthday. The villa was exactly as described on the website. Everything was very clean,plenty of towels,bed linen was lovely. Beds were comfortable, the aircon worked really well (only in the lounge/kitchen). The swimming pool was spotless. There’s an outdoor barbecue area which even has it’s own sink! The veranda at the front of the villa has a table that seats 6/7 people where you can watch the moon rise. You can pick the oranges from the trees in the garden to make fresh juice whenever you want! The town of Coin is very Spanish with hardly any tourists and really comes to life after dark when everyone comes out to eat and chat. I must mention Gabriel and Yolanda who came into Coin to meet us and show us the way to the villa ( it would be a bit difficult to find otherwise). Our security deposit was transferred back into my account the morning after we returned home. This was a holiday to celebrate my wife’s birthday with our son, his partner and 3 grandchildren and everyone had a wonderful holiday. Dear Trevor, thank you very much for your opinion. Best regards. Absolutely loved our stay. The Villa is spacious, well set out and fully equipped with everything you might need. It's a lovely peaceful spot and perfect for day trips to Malaga, Nerja, Frigiliana and Ronda. Gabriel was excellent - he responded to the odd text immediately and was very helpful and friendly. In fact we are very much thinking of returning next summer! Muchas gracias, nos alegramos que todo haya sido genial y gracias por el comentario, esto nos ayuda a seguir mejorando. Un saludo. Excellent property which provided us with all the facilities we needed and an excellent base with which to explore the area. Some of the photos on the website don’t do it justice. We were a diverse group with ages ranging from 4 to 66 and we all had a lovely relaxing holiday and because we were so comfortable in the villa we actually had a few days where we only left to pick up supplies from Coín. We all loved the pool, particularly our 4 year old, and the large open space gave us loads of room to run around, play football, etc. The built in bbq was excellent and meant we had well cooked food in the glorious sunshine. The hosts were fantastic and gave us excellent recommendations of places to eat. Would highly recommend the property and we’ve had many comments from friends about the few pictures we have put on Facebook. Gabriel booked us into his villa at the last minute after we were let down by another villa. The house is very clean and very well furnished. The gardens and swimming pool are amazing. Very spacious and the location is great. In the countryside but central to everything. Gabriel is really helpful and makes sure that everything is ok during your stay. The only negative is that it would be great if there was a full oven and not just a mini one but otherwise fab property. Kids thought the pool was the best we had ever had . Thank you for rescuing our holiday from a disaster. Thank you very much, your words help us to improve. Glad to welcome you back to our house. A beautiful villa, full of character, which we thoroughly enjoyed for our 2 week stay in Coin with our 5 and 7 yr old sons. The villa was clean, organised and well equipped with everything we needed - it is so well maintained we felt like we had gone from home to home and settled in instantly. We found everything to be as described and even better than the pictures. Gabriel was very welcoming and provided us with all the information we needed. Our sons fell in love with the villa instantly, especially when Gabriel showed them to a bedroom perfect for the both of them, and it even had a stash of toys in one corner. We all enjoyed the good sized pool, the football set up and the table tennis. The temperature was well over 30C for most of our stay, but the inside of the villa remained comfortably cool, with the AC available to us when required. 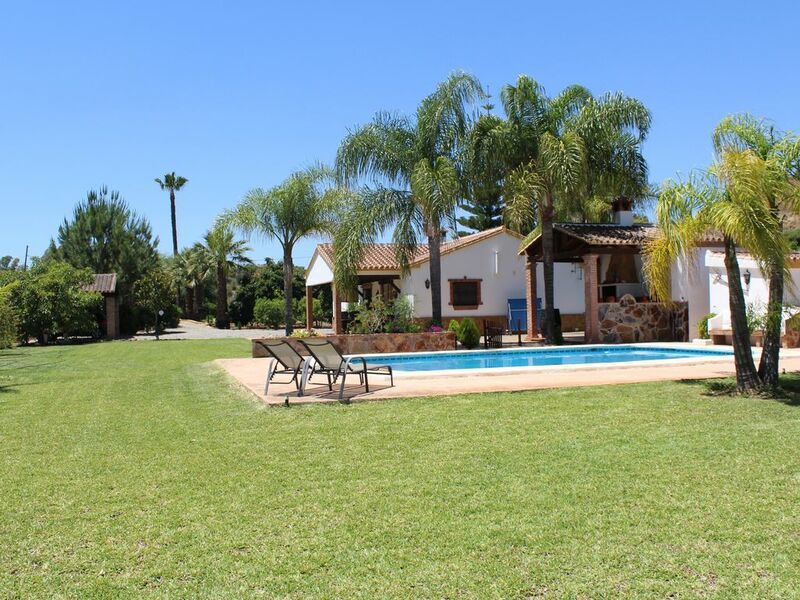 The location was ideal for us, with its country setting, local conveniences (including choice of 3 supermakets just a quick drive away), and ideal for touring the southern coast of Spain with a car. Our favourite family outing at Barranco Blanco was only a few minutes drive from the Villa. We would definitely recommend Villa Pereila and look forward to staying here again in the future. "Nos vacances ont été fantastiques! Super météo même pour le mois de novembre. Nous avons profité de tout: piscine, BBQ/cuisine extérieure, magnifique jardin fruitier (mandarines, oranges, citrons, grenades, etc.). Il y a tout ce qu'il faut dans la maison. Idéal avec enfants (de plein pied et grand jardin). Le village de Coin n'est pas vraiment joli mais on y trouve tout ce qu'il faut. Excellent point de départ pour excursions. Trajet pas trop long entre aéroport et maison." From Málaga Airport to Coín: Go to Málaga town for the motorway E15/A-7, exit for 'Salida nº231B' to Cártama-Parque Tecnológico-Universidad A-357 and follow to Cártama, after exit road and take the exit nº 48 to Coín and follow 8 km. Málaga to Coin 30 min. driving away.aprox. Restaurants nearby, Local cuisine and international resturants in Coín, Internet mobile with usb modem, we have a visitors book where we can find very suggestion about local places to visit,restaurants, shoppings and the experience of another clients.